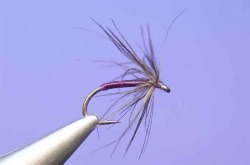 As old as our game, as popular as ever, as good as it gets: that's the soft hackle fly. There are many names and patterns but the thing that seems to be most important is keeping the hackle light and wispy enough to give the fly internal motion and action. In this part of the woods we are constantly referring to Rocky Mountain Fly for inspiration and patterns. This partridge PMD soft hackle is by Alexander Goeting, at Rocky Mountain Fly. Notice how the thorax is large enough to keep the hackle fibers spread and able to move in the current. 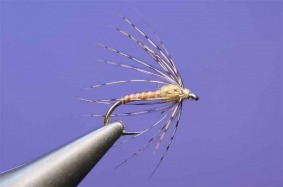 Another of Alexander Goeting's soft hackle flies. Bead heads have continued to grow in popularity during the last 12 - 13 years. Beads of glass, brass, ceramic, and plastic seem to be everywhere these days.